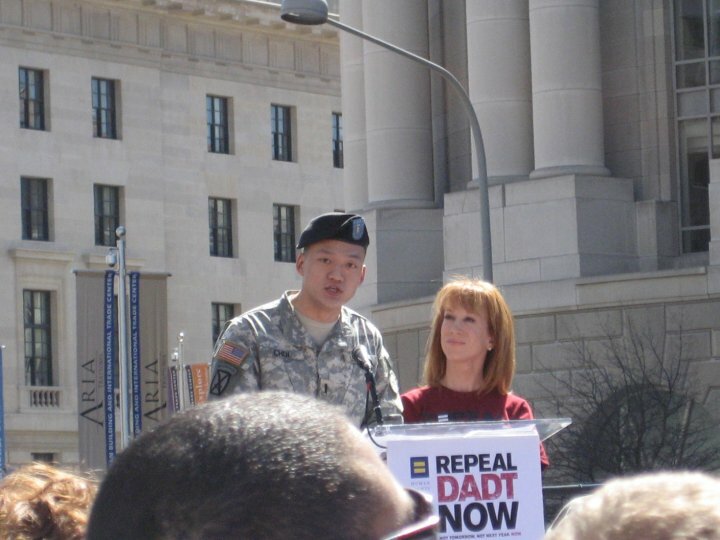 My partner Matthew sent an open letter to Lt. Dan Choi and with his permission I am posting it because it offers another view of the DADT repeal and Lt. Choi’s actions. I’m becoming increasingly concerned with your actions while wearing the uniform of the various branches of the United States military. As a former Captain in the United States Army, and one who served in silence, I can tell you that one of the distinguishing marks of a good Officer and soldier is maintaining decorum in the public eye. I can tell you, LT Choi, having borne first-hand witness to your actions, they show a lot less decorum than you should be displaying while wearing the uniform of a US Army Officer, especially a graduate of the US Military Academy at West Point. I understand, appreciate, and empathize with your passion for equality, especially for those of us who defended the freedoms that we do not get to enjoy. We WILL see the repeal of Don’t Ask Don’t Tell, and the passage of ENDA is on the horizon. You’ve been discharged from the US Army once under DADT, and have been allowed to rejoin your unit. I’m sure you’ve served with honor, undertaken and completed each and every mission you’ve been assigned, and done so with passion, conviction, and pride. Don’t give critics any more fuel for their dying fire; Secretary of Defense Gates has already given directives to senior military leaders outlining new rules for accusations and investigations, and to make way for full integration for all into active service. It’s not going to happen overnight; it CAN’T happen overnight. There are too many challenges and military cultural changes that need to be overcome before a safe and thorough repeal of DADT is enacted. We all want DADT repealed. It needs to be done properly. This is not a situation where we want to say, “Oops, can we do that over, we didn’t think this part all the way thru.” Maintain your own dignity and decorum, and the integrity of wearing the uniform of the US Military. Please start acting appropriately while wearing your uniform in public.